FastFetch was first-to-market with batch picking cart technology employing voice, wireless barcode scanning, and lights for guiding both picking and putting tasks—all working together in a synergistic fashion to achieve fast and accurate e-commerce order fulfillment at an affordable price. The technologies employed for cart-based e-commerce order fulfillment can be reconfigured to implement solutions for store replenishment, manufacturing kitting, and returns processing. The solution designed for a given application depends upon several factors including the nature of the products being handled, customer order profiles, the warehouse layout, picking area organization, replenishment strategies, efficiency of pack/ship operations, and perhaps existing automation that can be effectively utilized. FastFetch’s batch picking cart technology often provides an excellent solution to e-commerce order fulfillment. 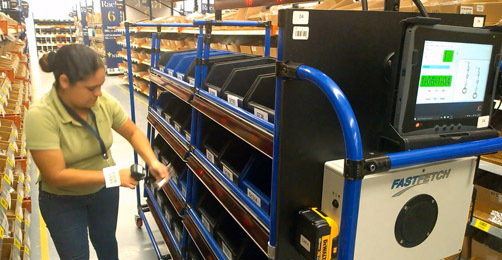 While the highest picking speeds are achieved when both product bays and carts employ lights, our cart- based technology can work without lights on the product bays. 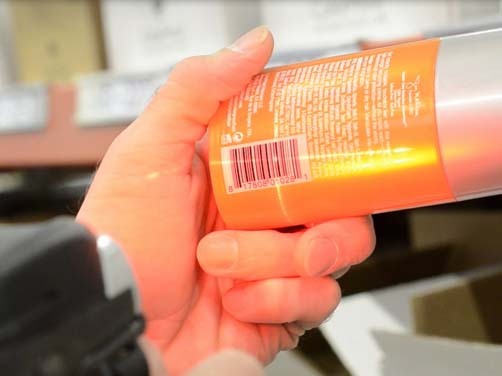 High levels of performance can be achieved by using voice to guide the picker, barcode scanning to confirm picks, and light-directed placement of picked items into cart locations. Starting an installation without lights on the product bays often provides an attractive entry point and also provides for an incremental growth strategy to meet changing business needs. Store replenishment must be quick and efficient. The best store replenishment strategy for a given DC depends upon the order mix and the nature of the DC itself. In some instances, batch picking carts can be used effectively for store replenishment. In other instances, one or more put walls might provide superior performance. Our put walls can be integrated with our batch picking carts to yield efficient, cost-effective store replenishment solutions. Manufacturing assembly lines require timely delivery of the correct parts to work cells to support manufacturing processes at the speed of the assembly line. 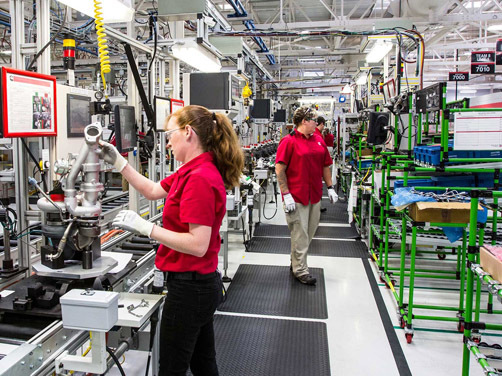 Automotive assembly lines have the added requirement of arranging parts in the correct sequence corresponding to vehicles on the assembly line. Delivering the wrong parts or the wrong count of parts can stop the assembly line, usually at considerable costs. Picking for automotive assembly lines has much in common with e-commerce order fulfillment—but there are significant differences. In addition to the sequencing aspect that is essential in supporting parts movement processes for automotive assembly lines, carts used to retrieve and supply parts to work cells can differ widely in their configuration and capacity. The wide variability in cart configurations presents special challenges that are not normally encountered in e-commerce order fulfillment environments. FastFetch’s solution for automotive assembly line parts retrieval features user-defined graphical interfaces for supporting the wide range of cart configurations needed for the different work cells. The e-commerce boom has created a need for increased efficiencies in returns processing, sometimes referred to as reverse logistics. In some environments, returns processing can be even more complex than the distribution process. Returned items must be properly processed, depending upon the item and its condition. Some items, for example, can be returned to inventory for restocking, some can be refurbished or repaired, some need to be returned to the supplier, and some need to be scrapped. Furthermore, returned items do not necessarily arrive on a predictable schedule. The basic challenge is to receive returned products and quickly sort them to small, warehouse put-away location proximities for further processing. This process should be fast, error-free, and low cost. FastFetch has developed a returns processing solution using multi-tiered put walls to quickly sort random collections of returned items and transport them to the target warehouse location proximities (e.g., SKU location, rack, section, aisle, etc).